This year, all things seem to be late, including our spring turkeys as they seemed to stay in their winter groups and break up much later this season. 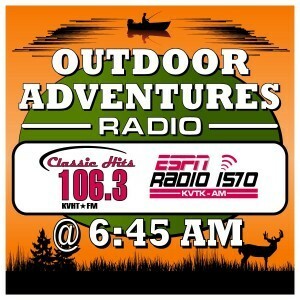 Generally, by May 1, we hear that those folks who like to “scrounge” around in the outdoors, who, like myself would be out looking for wild edibles, mushrooms and later on wild asparagus. Morels, generally found throughout our area, slow at showing up. They vary from off-white to gray in color and the easiest way to explain what a Morel looks like is to look for a mushroom growing on the ground that resembles a cone shaped brain. Appearing in the spring of the year when temperatures reach 50 degrees and largest numbers found when temperatures hit the mid 50’s. Those who have hunted mushrooms for years use several indicators to tell them when Morels should start to appear. If you have a Lilac bush in the area, keep an eye on it, as when they bloom, it is a good bet you will find Morels. This year, the Lilacs and Crab apples are just starting to bloom, as well as “around” the week of Mother’s Day are good indicators that the mushroom hunting season is under way. Some go by the Farmer’s Almanac to figure out when to start searching for Morels. If you look in the almanac, take the average date for the last frost and add two weeks to that date, you should be pretty close to the peak Morel season. The moisture, sunshine along with warmer temperatures has a lot to do with when Morels appear. What we have been lacking is several days where the daytime temperature hits 55 to 60 degrees. Along with warm temperatures, moisture is also important, with many mushroom hunters saying that the best time to hunt for Morels is after a rain, when temperatures are around 60 degrees with high humidity. Morels appear earliest in sandy areas, on south facing slopes or in fields that have been burnt as these areas warm up quickly and retain heat longer. One of the most asked questions pertaining to mushrooms are where do you find them? It seems the first Morels show up on islands in the river, sandy areas and fields with dead or dying trees. One of our most successful hunts was along the river; early in the season around an n undisturbed cornfield; this field was loaded with them. It was a new field and until a year or so before had been a wooded area. The decaying roots from the grubbed out elm and cottonwood trees, made the field an ideal places for the Morels to take root. I have also found mushrooms around trees that had been declining for several years, eventually dying and were now lying on the ground. Mushrooms seem to appear around these dead cottonwood and elm trees about the time that their bark starts to fall off. The first Morel is always the toughest to locate because they blend very well with the forest or vegetated ground. Once you have located one, kneel down, checking the area out closely because, once you find one you generally find a lot. One thing is certain when it comes to finding Morels; there are no set rules as to where they might be located. 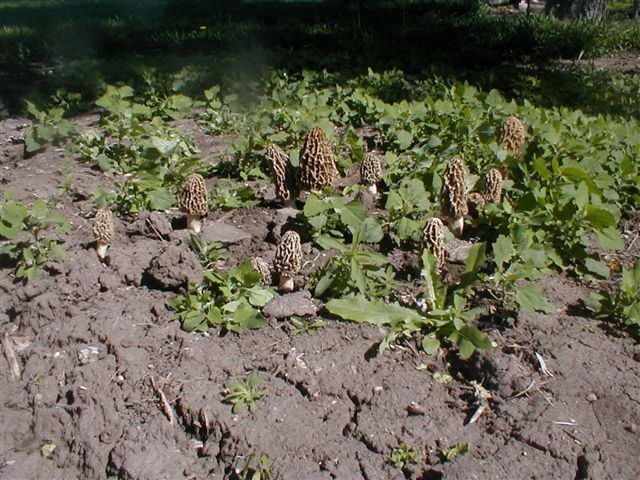 Conditions change from day to day during the spring and a hillside that was barren on Monday may get a rain shower or warmer temperatures, causing the hillside to be loaded with Morels by Wednesday. My preferred method for locating mushrooms is not very scientific; it is the old wonder around aimlessly method, working my way through the vegetation until I spot one. It is not a bad idea to stop from time to time and kneel down, getting a better view of the area as many times Morels will just start to push up through the leaves and hard to see. For years, Morel hunters have hit the woods with bread sacks, ice cream buckets and other non-porous containers. Some seem to believe that these things have lead to less Morel mushrooms. Mushrooms reproduce through spores, which need to be returned to the ground in order to grow and if they are picked, placed in a solid container like those mentioned above, we may be denying the Morels the opportunity to disperse their spores and re-seed the area. In order to allow the morels to throw their spores, it is not a bad idea to use collection bags that are porous such as onion bags or some type of a bag that allows the spores to be release back into the air. Mushroom hunters or shroomers as they call them down south have their own language and in mushroom hunters’ jargon, a bunch of morels is a “mess”. Once you have found a mess of mushrooms, you need to clean them before preparation. The first thing is to split the mushroom in half from the top to the bottom. Then rinse them off over running water as the crooks and crannies of the mushroom could and will contain sand or insects. After you have rinsed them thoroughly, you will want let them set in water for a short time in order to flush sand, debris or stubborn insects out of them. Do not allow them to soak in water for an extended period as they will soak up the water and become spongy. After the cleaning, comes the best part of mushroom hunting, where you prepare them for eating. Everyone has their own way of preparing Morels including, fried or in mushroom soup. One of my favorite ways to prepare the morels is to fry them up in some type of batter. I mix up a batter made with equal parts, eggs beaten with milk and crushed up saltine crackers. Once you have rinsed them, let the mushroom drip off on a dry towel, and then dip in the mixture made from the beaten eggs and milk, covering them thoroughly. Place the coated Morel into a pan and cook in butter until crisp. Do not over cook them, as they will dry out, becoming hard and crunchy. Morels are best prepared fresh, but if you have a good mushroom hunting season and would like to preserve or save a few for future use, mushrooms can be dried, frozen or blanched. Morel hunting is excellent ways to get outside, to not only enjoy the outdoors but and enjoy the bounties that Mother Nature provides. It may be later this year, but, do not give up on finding Morels and while you are out walking along the creek, river or hillsides look around, as Morels pop up throughout our area and you never know where they might appear. They are excellent eating and a great way to start out the season!